Fencing a yard of adequate height to prevent deer is illegal within Ann Arbor. Aside from being unsightly, it just sends deer to someone else’s yard– IT DOES NOT SOLVE THE PROBLEM. And it can be deadly. most deer damage is due to their protected status the principal factor causing the excessive large deer population in the united states is that deer are a protected species, and an artificial population level is maintained by deer management authorities to satisfy the demand for deer hunting. automobile and aviation collisions, disease transmission, environmental degradation, and destruction of ornamental plantings. 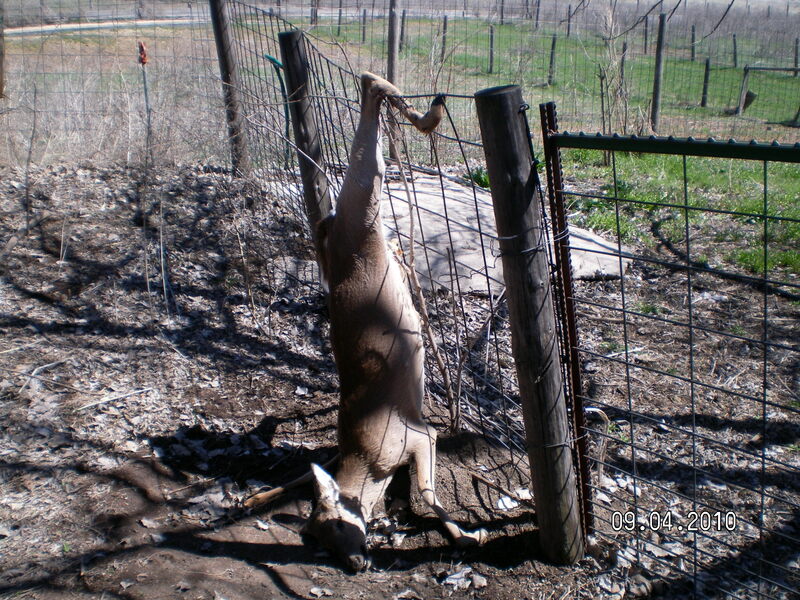 One practical method of controlling deer damage is the use of exclusionary fences. The relatively high cost of labor and materials required to build effective fences has limited most applications to the protection of orchards, vegetable farms, other high-value resources, and mitigation of human health and safety risks. Improvements in fence technology resulting in less expensive, yet effective fences have expanded the use of fences to manage damage caused by deer. peanut butter attracts the deer to lick it thereby giving a non-lethal shock to the deer on their tongue. EFFECTIVE DEER FENCES, University of Vermont Extension Department of Plant and Soil ScienceHeight, or width, is probably the most important factor with deer fences, especially if high deer pressure. White-tailed deer can jump almost eight feet high, so effective upright fences against them should be this high. Deer may be able to jump high, but not both high and over a distance. So a fence may not be as high, perhaps six feet, but slanted outward. The deer will try walking under the fence and meet resistance. Such a slanted fence should be at a 45-degree angle, and may consist of fencing with a few strands of additional wire on top for extra height. According to Houzz, you can make your deer fencing attractive. Oh joy! Can you imagine a whole city of high fences? Attractive or not they would certainly go further to destroy the openness and feel of Ann Arbor, the “Tree City”. I especially like the corrigated metal wall! Click arrows at bottom of image to move to next one.